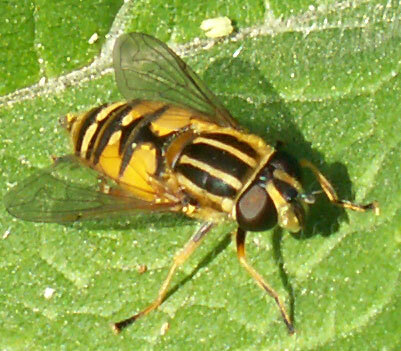 About five hoverflies of three species visited the Ivy on the Pixie Path to Mill Hill. Two were Drone Flies, Eristalis, one was a much smaller darker species which could have been Platycheirus and the last two were Marmalade Flies, Episyrphus balteatus. 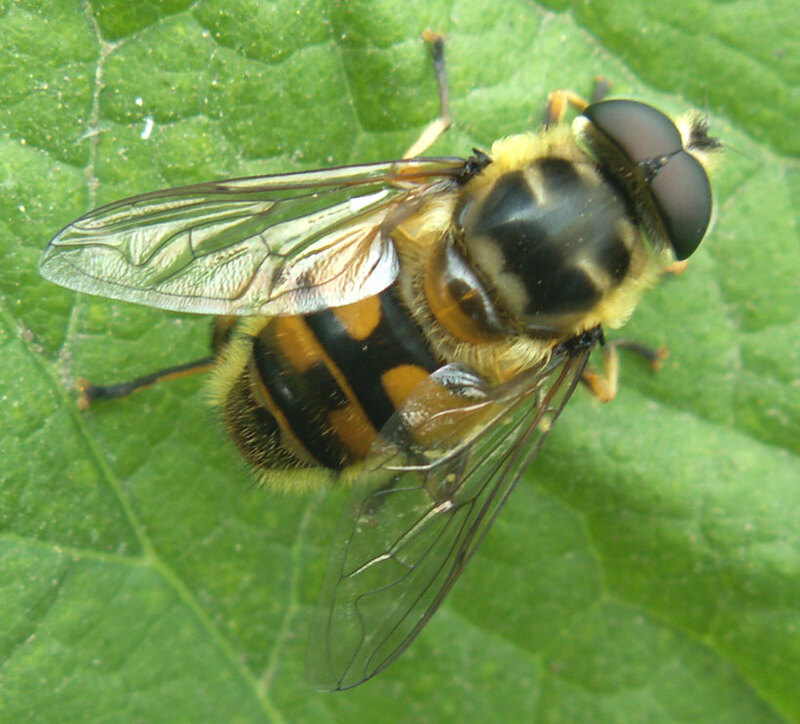 One Marmalade Fly, Episyrphus balteatus, was seen in the Butterfly Copse near the Waterworks Road. 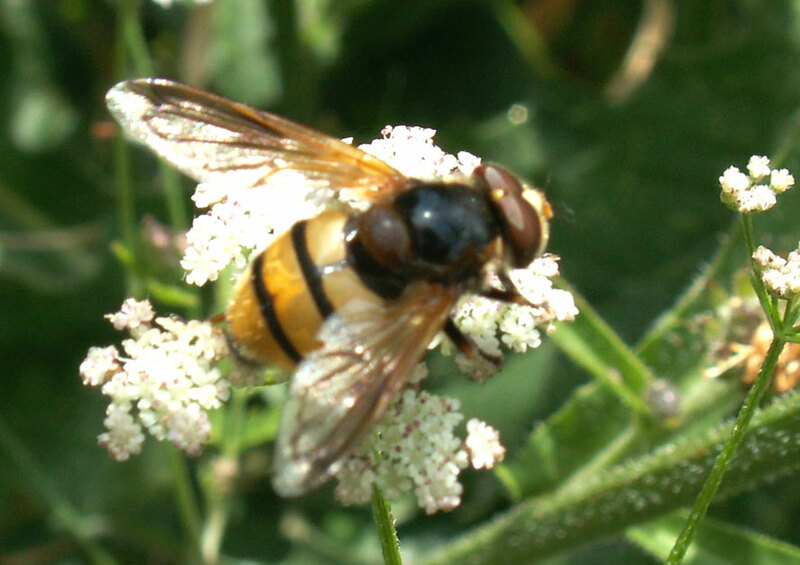 There were a few small hoverflies in the wood to the east of McIntyres Field, Lancing Ring Nature Reserve. They were smaller and darker than Episyrphus balteatus and could be a Platycheirus. 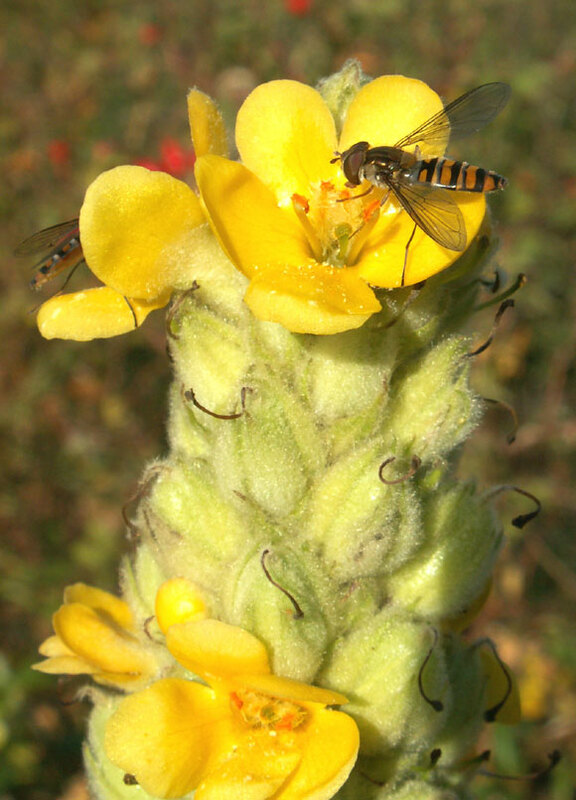 A few Marmalade Flies Episyrphus balteatus, visited Great Mullein flowers on the lower slopes of Mill Hill. There were frequent hoverflies on the Ivy by the Pixie Path in the north-west part: Myathropa florea and Drone Flies, Eristalis, and at least one small Sphaerophoria, plus Syrphus and another few of the smaller ones which I did not identify. A hoverfly Helophilus pendulus was seen visiting Ragwort next to the Downs Link Cyclepath south of the Toll Bridge. 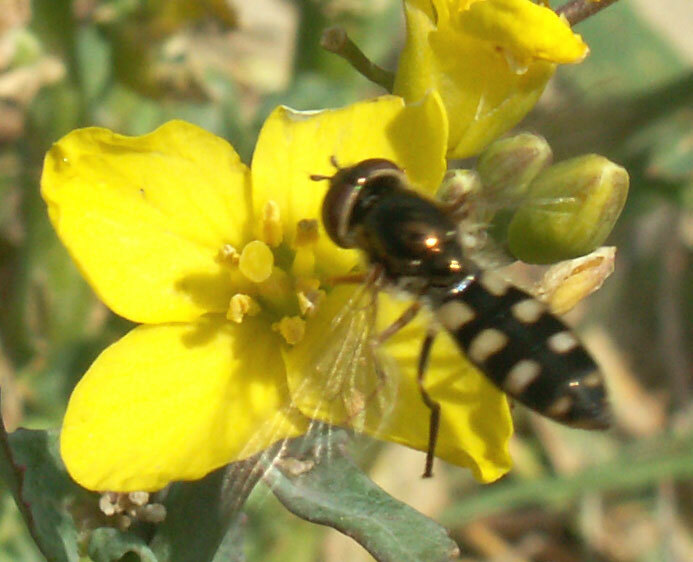 This hoverfly seems to be particularly fond of this plant to visit, but it was the only yellow flower in the area. A large species of Volucella was seen on a Bramble at the top of the Pixie Path. Its identity could not be confirmed. My tendency is to think it was Volucella inansis. 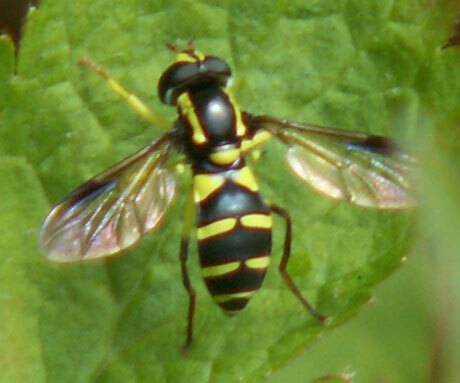 The hoverfly Helophilus pendulus was seen visiting Ragwort next to the Downs Link Cyclepath south of the Toll Bridge. The hoverfly Volucella inansis was seen on the Pixie Path on the outskirts of Shoreham. 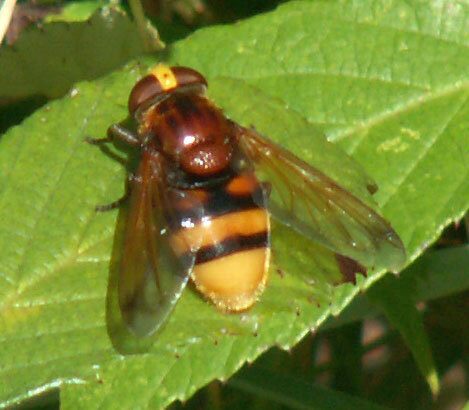 The hoverfly Volucella zonaria was seen on the Downs Link cyclepath south of the Toll Bridge. The hoverfly on the right settled in the shade on the Downs Link cyclepath south of the Toll Bridge. This one is definitely C. festivum, the posterior edge of the abdominal bars is much straighter in C. vernale. As an ominous black cloud loomed in the west, I saw my first of the spectacular hoverflies Volucella zonaria both at the top of the Pixie Path. Two species of hoverfly made an appearance on an overcast day: firstly a small hoverfly Xanthogramma pedissequum (above right) in the Butterfly Copse near the Waterworks Road, and a Myathropa florea on the path on the south side of Frampton's Field, Old Shoreham. Looking very much like a bumblebee at first, the hoverfly Volucella bombylans var. plumata was seen on a Creeping Thistle on the Downs Link path south of the Toll Bridge. It was the first of the year. Hoverflies Helophilus pendulus and the ubiquitous Marmalade Flies Episyrphus balteatus, make up the bulk of the still only occasional hoverflies in Shoreham town and the outskirts. A small hoverfly landed on an Annual Wall Rocket growing from the dried out earth on the edge of the field north of Cuckoo's Corner. Because this hoverfly had just landed, the wings had not covered the abdomen. 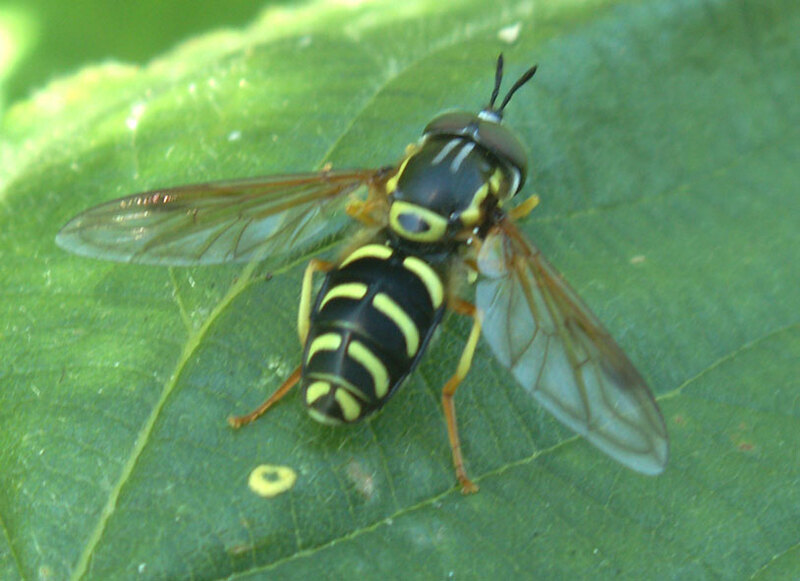 This hoverfly is my first Scaeva pyrastri of the year. My first hoverfly Helophilus pendulus of the year was seen at Cuckoo's Corner in the vegetation by the gate. My second Myathropa florea of the year was seen in the vegetation at Cuckoo's Corner. There were at least twenty Rhingia campestris hoverflies on the small patch of Green Alkanet at the southern end of the Waterworks Road. The first hoverfly Myathropa florea of the year landed on me in the Butterfly Copse and the expected Rhingia campestris hoverflies visited Green Alkanet and White Deadnettle on the Waterworks Road verges. A handful of Rhingia campestris hoverflies visited Green Alkanet at the southern end of the Waterworks Road. A few Epistrophe eligans hovered around at the top of the Pixie Path where the old stile was. Still only the occasional Syrphus hoverflies were noted. Hoverflies were occasionally seen including Drone Flies, Eristalis, Marmalade Flies Episyrphus balteatus, and Syrphus; all on Alexanders. A Syrphus hoverfly visited a Dandelion on the Pixie Path. There were several species about, at least three, but I only identified a half a dozen separate Drone Flies, Eristalis. 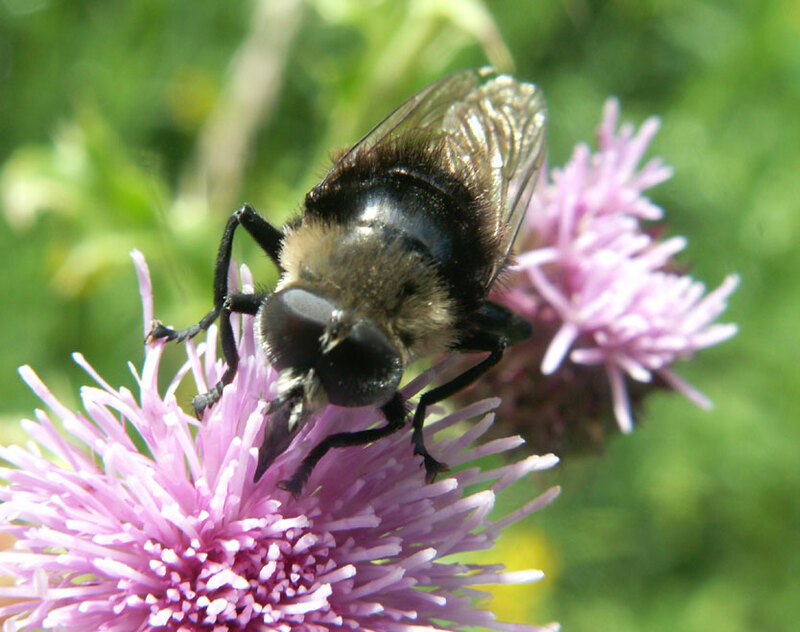 One was identified as Eristalis pertinax. Drone Flies, Eristalis, were occasionally seen on Alexanders. In a brief burst of early afternoon sunshine, I spotted my first two hoverflies at the top of Chanctonbury Drive (SE of the bridge to Mill Hill). They were a Drone Fly, Eristalis, and a Syrphus.